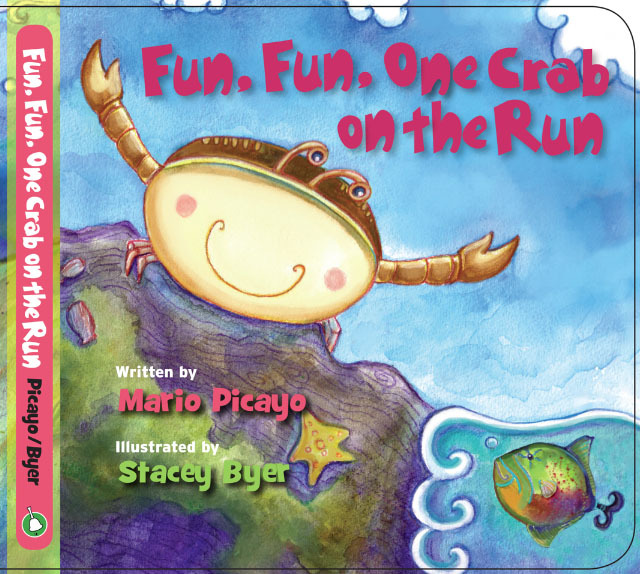 ‘Fun Fun One Crab On The Run’ is a beautiful, imaginative and useful new children’s board book for age range 3–6 that has just hit the Caribbean market. Published by Little Bell Caribbean (New York), it is the latest title by best-selling author Mario Picayo, who selected Grenadian illustrator Stacey Byer to create the illustrations. “I was attracted to her use of colour, playful style, and the humour I saw in her work,” explains Picayo, who met Stacey during a visit to Grenada in 2012. This delightful counting book for young readers follows the characters as they explore, swim, fly, and blossom, while simple rhymes connect the numbers on their journey from one to ten. It is a perfect tool to introduce children to numbers. A chart at the end of the book lets the reader know the name (common and scientific) of each real Caribbean animal and plant included in the illustrations, and turns the book into a “find it” game. The book is already available on the American market and may be purchased online at Amazon.com. 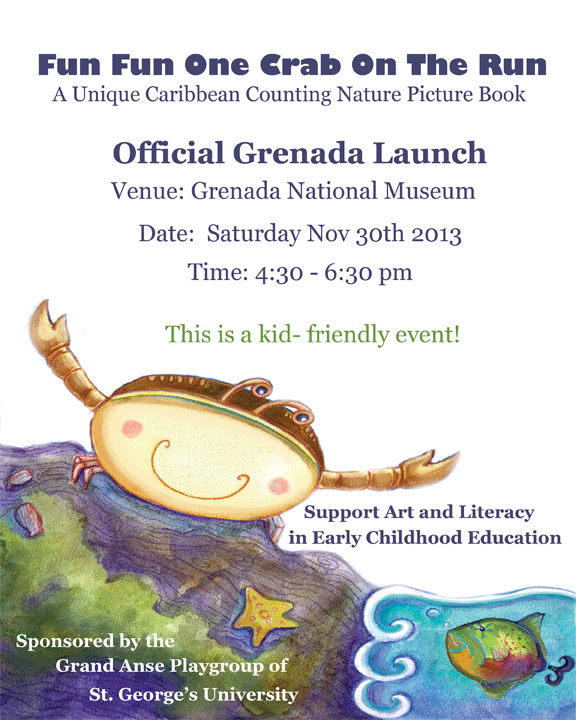 The official Grenada launch for the book (which is a kid friendly event) will take place at the Grenada National Museum on 30 November 2013 from 4:30 to 6:30 pm. 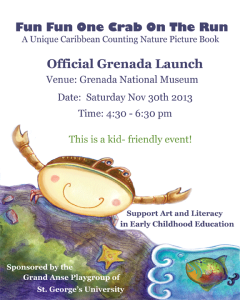 To promote the value of art and literacy to early childhood education in Grenada, there will be a presentation on reading picture books, illustrations on display, as well as copies of the Fun Crab Books for sale. In addition, November is Picture Book Month and to honour this, the illustrator is donating 150 copies of the book to pre-primary and primary schools in Grenada. This is being made possible with the generous assistance of a number of corporate sponsors, including NAWASA, EcoDive, Country Cold Store, 3BS, Grenada Pharmacies, Wade Optical, Island Dental, Spice Isle Retreaders, Grand Anse Playgroup, and Sweet Water Foundation, as well as personal contributions from individual donors. The distribution of these books will be facilitated by the Ministry of Education post-launch. This free event is open to the general public.